Two severed robot heads are sat on the shelf, their eyes, as ever, glassy and lifeless. The scalp-plate of one has been removed, exposing a circuit board brain. Professor Mary-Anne Williams’ is perched on the edge of the desk opposite, beneath a row of books on computer science, German philosopher Immanuel Kant, logic and comparative psychology. She looks out through glass panels onto UTS’ Innovation and Enterprise Research Laboratory, the so-called ‘Magic Lab’, which is filled with robots of varying shapes and sizes, their plastic exoskeletons in every shade between beige and brilliant-white. Some of the bots are bug-eyed and cutesy, with coloured lights that frame their features. Others are naked and dismembered, with mechanical innards on show. One has another in a chokehold. The researchers’ prank makes a point, and one they’ve been busy working to advance. For robots to fully realise their usefulness, Williams says, they will need to grab our attention and gain our sympathy. But to do so, they’ll first need to develop new forms of intelligence. Developments in artificial intelligence have to date been focused on problem solving. From mastering the game of Go to finding patterns to predicting mortality from medical scans, AI has excelled at determining solutions to complex tasks. But if intelligent systems are to exist alongside humans in the physical world they’ll need a different skill set. “You need emotional intelligence, which is a system having self-awareness and understanding its impact on others; other agents, other people, other robots, other tech that can detect them. And then you have social intelligence: interactions, cooperation, convincing humans to help the robot do things that it can’t do alone,” Williams explains. Take, for example, a simple mail delivery robot that carries the day’s post from an office reception to the various recipients. “We have that tech today. But some of the behaviours of such a robot are just inappropriate,” Williams tells CIO Australia. With social skills, even simple bots become a lot more useful. A vacuum cleaner bot for example, would have the intelligence required to convince children to pick up their toys with a game, so it can clean the carpet. With these ‘human’ skills, robots will better be able to make their way in the world by gaining our help, be it by convincing us to provide the information needed to complete a task or simply to open a door for them. They’ll need to grab our focus, manipulate us into assisting them, earn our trust and trigger our sympathy. “It’s a lot about persuasion. And in order to persuade you need to engage, you need to communicate what the problem is for which you need help,” Williams says. Adding a social aspect to the technology, however, is relatively new. There’s no better way to test hypotheses of human-robot interaction then by sending robots out into the real world, Williams explains. Last year Commonwealth Bank of Australia (CBA) and real estate giant Stockland, took delivery of Chip – a model REEM from Spain’s PAL Robotics – working with UTS and researchers from the Australian Technology Network of Universities to find out how people interact with the bot in a retail setting. 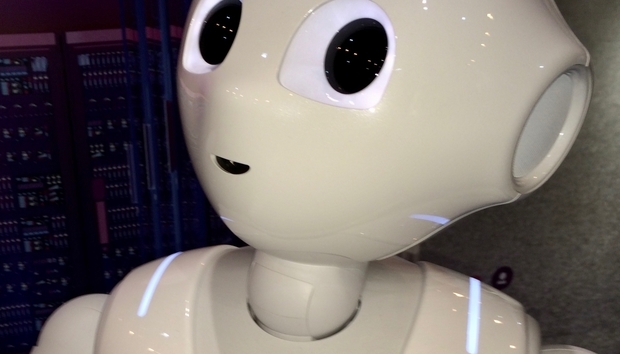 UTS recently became home to two humanoid Pepper robots from industry partner, Softbank Robotics. Later this month UTS will be taking the Peppers to the RoboCup@Home Social Robot League competition in Japan. The team – the only one from Australia to qualify in the category – includes members with specialisms like human-robot interaction, robot emotions and robot cooperation. A workshop with CBA and Softbank in August will explore the relationships people build with robots in different contexts: like would you want your home assistant bot to have the same personality and knowledge of your habits as the bot in your shopping trolley? “You don’t want to spend your whole life sharing your preferences with all the tech. We’ve got to find this balance of managing privacy and the intrusion into you and your life, and delivering a service you want, that improves you experience as a person living out your life at home, as the customer of a business, and when you’re out and about in public,” Williams says. Researchers have also posed as robots – with convincing costumes and movements – to test the public’s reaction to greetings from high-fives to hugs. If the future is anything like that seen in science fiction from Short Circuit to Humans to I, Robot, physical bots will one day be living and working among us. Developing their social and emotional abilities is crucial work, and UTS' commercial collaborators – which includes Ernst and Young, Telstra, Cisco, Google and IBM – are keeping a close eye on developments. The likes of Nobel Prize Committee member Peter Gärdenfors and Apple co-founder Steve 'The Woz' Wozniak sit on the research board. “Robotics is the new psychology. It’s the new philosophy. You can’t do this kind of work without a robot because it requires enormous experimentation and getting robots out there interacting with people,” says Williams.